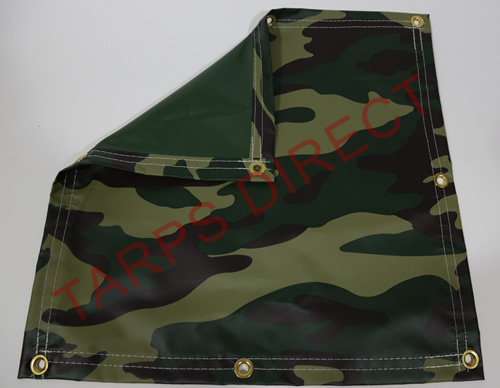 Tarps Direct's 18 ounce Camouflage Vinyl Coated Polyester (VCP) tarps are 20 mil thick. They are a very strong, waterproof tarp featuring a UV treated fabric that can be used in a wide variety of applications; from industrial applications to the outdoorsman looking for a durable cover that blends to its surroundings. Good for hunting blinds, canopy, dump, trailer and equipment covers as well as agriculture and other applications that require a strong cover. Rustproof brass grommets are located in corners and approximately every 24 inches on all four sides. Please call if you require a size that is not listed. Normally ships in 7-10 days. Tarps Direct's 18 ounce Camouflage Vinyl Coated Polyester (VCP) tarps are 20 mil thick. They are a very strong, waterproof tarp featuring a UV treated fabric commonly used in many industrial applications. Perfect for the outdoors person that wants to hide from his prey - great for covering the camp site, tree stand or as a pack to carry equipment. Vinyl Camouflage is also good for dump trucks, trailers, equipment, agriculture or other applications that need a strong cover. If you are an hunter, trapper or someone that wants to hide themselves or "stuff", the camouflage 18 oz. vinyl tarp is the hard working tarp just right for your needs.